The oceanside beaches and waves are what originally attracted me to Hatteras Island. 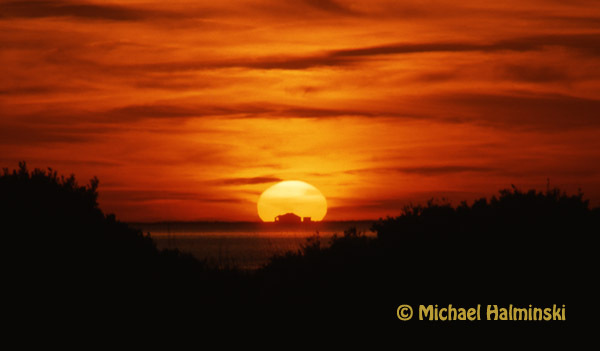 But once I got established as a resident, I realized there was more to this barrier island. 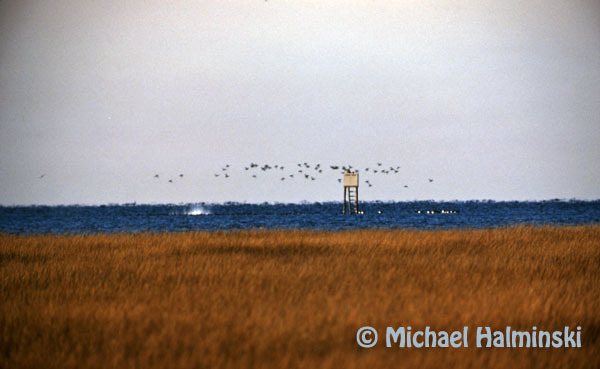 The Pamlico Sound, or bay side, is a unique and precious resource. 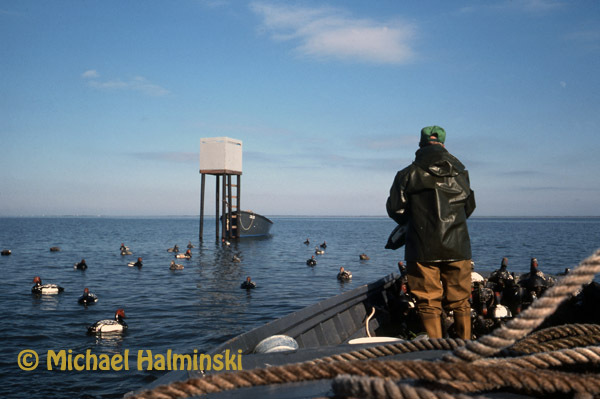 I was really impressed by it’s bounty for the commercial fishermen navigating those waters. 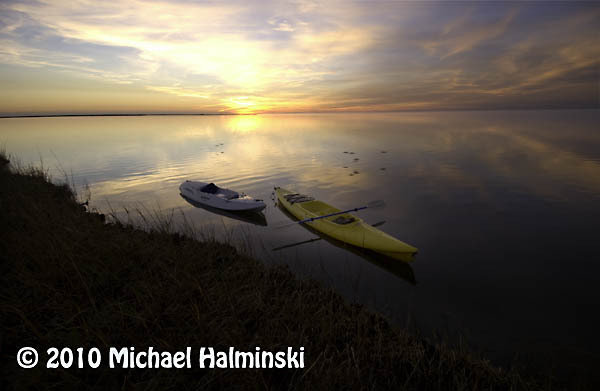 The Pamlico Sound, one of the largest estuaries in the country, is tranquil and beautiful. But I soon learned that it could also turn stormy and treacherous. It has claimed the lives of three of my personal friends, all commercial fishermen. A cold front coming up the Pamlico Sound is a sure sign of changing weather. Tides are generally driven by the gravitational pull of the moon. 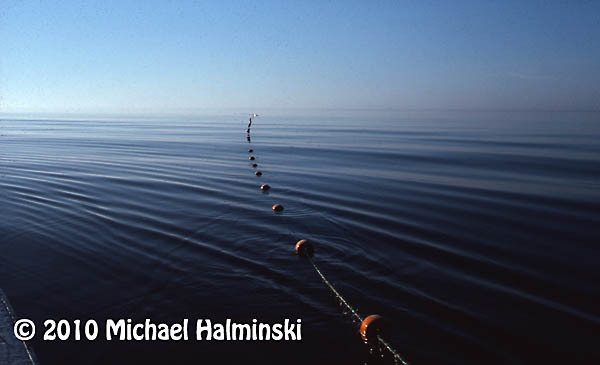 This is true, but the Pamlico Sound tides are mainly generated by wind. 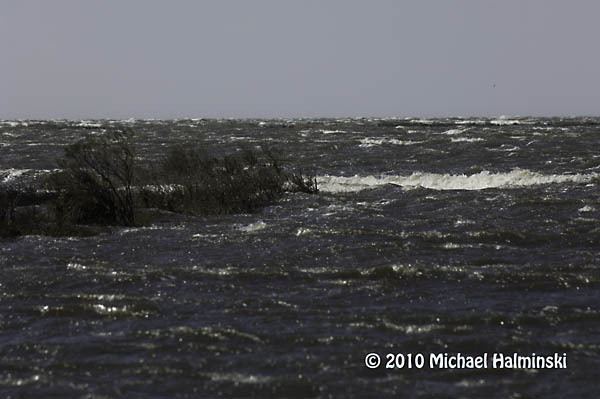 Winds blow the relatively shallow water from one side to the other. Here in the Rodanthe, Waves and Salvo township, winds from a westerly direction push the higher tides in our direction, while depleting the waters on the mainland side of the sound. Whenever we have a substantial west wind, we can get inundated by tides so high, that roads and properties get flooded. It’s times like this that a little elevation means everything. 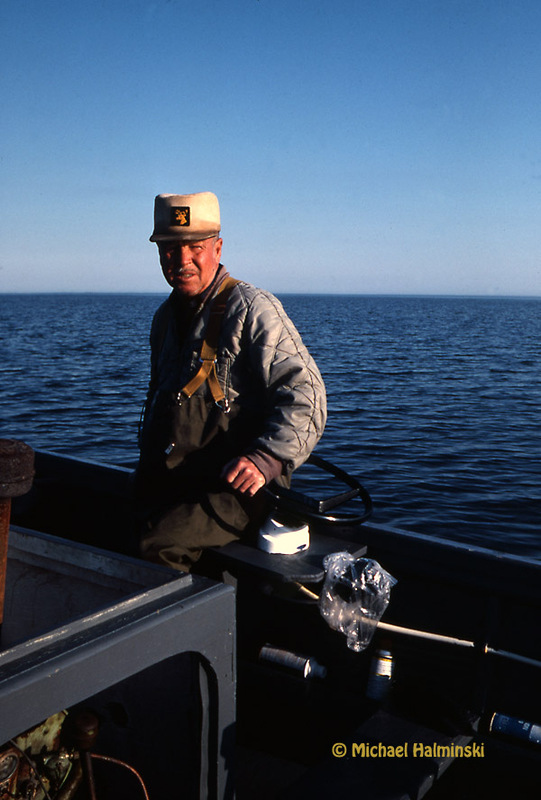 In 1986, Charley went right up the middle of Pamlico Sound. Fortunately it was a minimal hurricane with winds of only about 80. 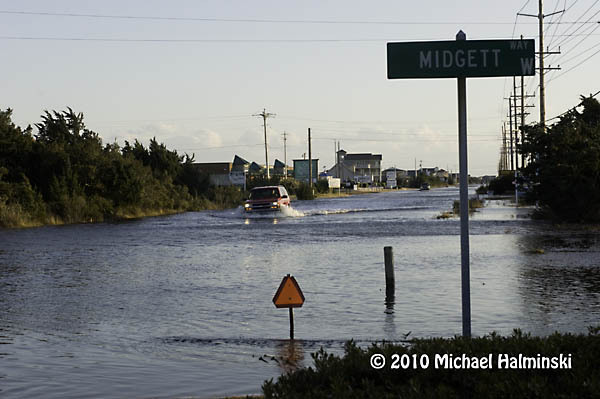 The above image shows the commercial fishing harbor in Rodanthe with seas coming over the bulkhead and on to the roadway. In 1999 a category 5 hurricane, named Floyd, made landfall in South Carolina. It wreaked havoc on the mainland to our west, but spared us with minor flooding and winds of only about 50 mph. 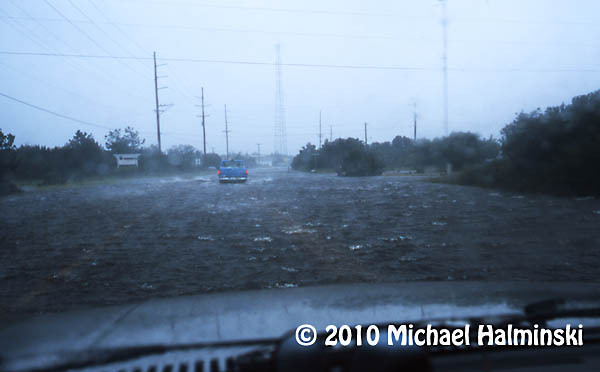 Here I drive my old sacrificial Dodge truck through high tide near my home in Waves. My yard during Floyd was under 2 feet of water. 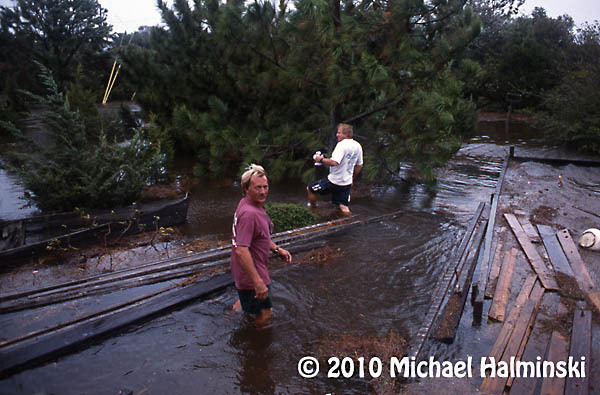 Here my neighbors, CE Midgett and Dale Midgett wade through the floating debris. 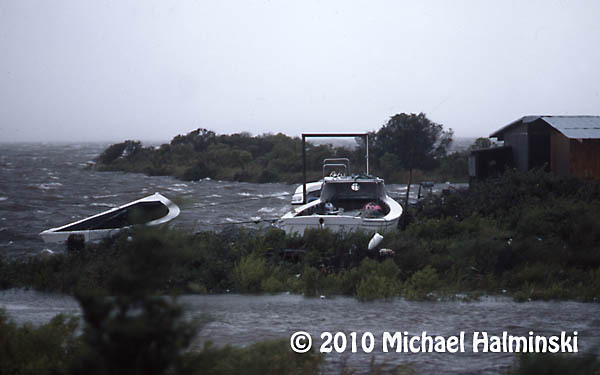 Conversely when winds wail from an easterly direction, the water on our sound side falls, sometimes enough to expose the bottom for a mile out, like during this northeaster in May of 2005. The most severe tide that I’ve seen in over 36 years was during the March storm of 1993, when we experienced westerlies of 100 miles an hour. This was caused by a powerful low pressure system advancing up the east coast, not off shore, but centered to our west. We had tides driven 8 to 10 feet above normal. That day the sound waters met the ocean dunes. Cars were ruined and homes damaged by flood. I had 4 feet of water in my yard, not to mention the breaking waves. Old timers say it was the worst flooding since the storm of 1944. Our worst case scenario is to have the eye of a powerful hurricane going right up the Pamlico Sound. Just last week we had westerlies of 35 to 50, with higher gusts. The water came up quickly, although not with the ferocity that I’ve seen before. It was just enough to disrupt business as usual, and cause a nuisance. The tides were about 4 feet above normal. So I had several inches of tide in my yard. Portions of highway 12 were under 1 to 2 feet of salt water, not good for the life of transiting vehicles. This last storm brought about 8 inches of sound tide in my yard. Home sweet home! The drill starts with vacating vehicles from the premises and parking them on higher ground. My west property border meets the sound. As you can see, the vegetated wetland absorbs much of the wave action. 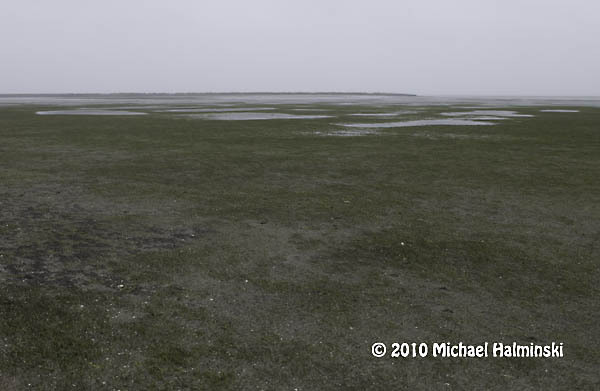 I don’t understand it when people building on the Outer Banks clear cut, remove this buffer or fill the marsh. It’s really all that holds this sandbar island together. This shot was taken last week, February 10. I wonder if this driver has a captain’s license. 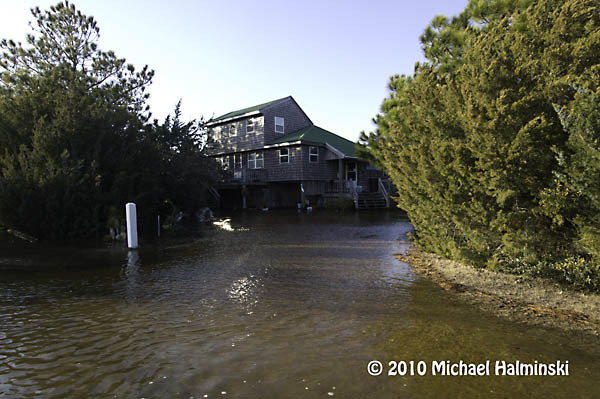 Excessive tides have always been a way of life on Hatteras. It’s something that requires readiness and preparation. Sometimes it’s predictable. Other times it’s more of a surprise. It’s not a matter of if, but when the next one will occur. 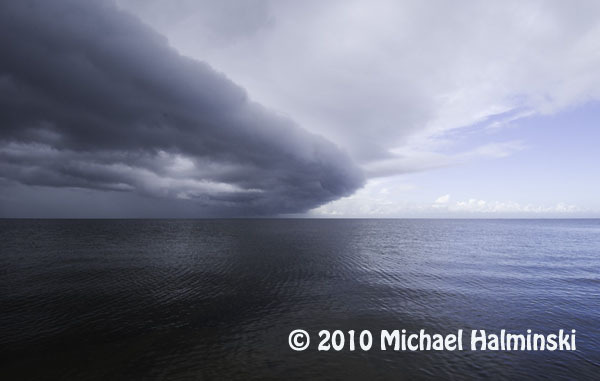 This entry was posted in commercial fishing, boat, pamilco sound, gillnetting, Outer Banks, Pamlico Sound, storms, Weather on February 16, 2010 by j0jgvm89bj. You often hear about how people in the arts have to survive early on in their careers. Some work in restaurants or construction. I’ve been there… done that, but I also had some other interesting lines of work to make ends meet. Back around 1975, when there was still considerable waterfowl hunting here, a neighbor asked if I wanted to earn some extra money. 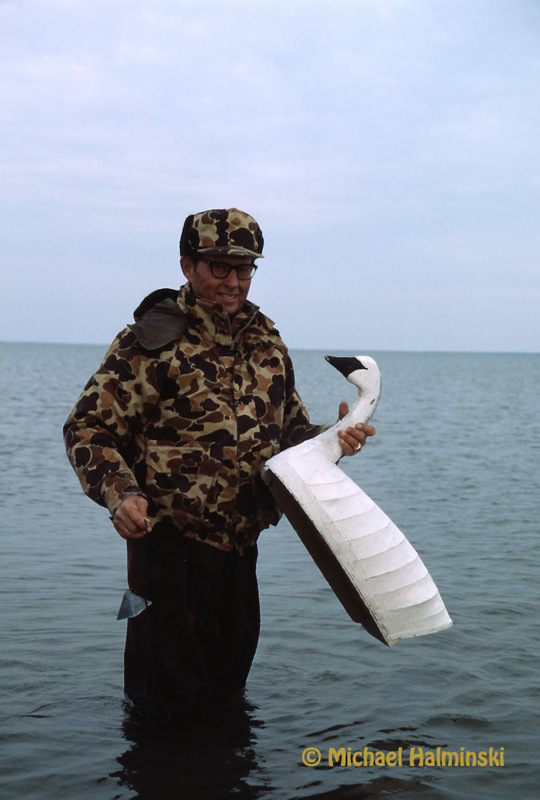 It turned out that they needed another waterfowl hunting guide, with no experience necessary. Uneasy at first, I quickly learned to emulate what the experienced guides did. They prepared boats, blinds and decoys among other things. The work was tough, cold and wet. Hunting trips required 24 hour service, plus awakening at 4 AM to get hunters ready. But as with many things in retrospect, it was a pretty valuable and unique experience. 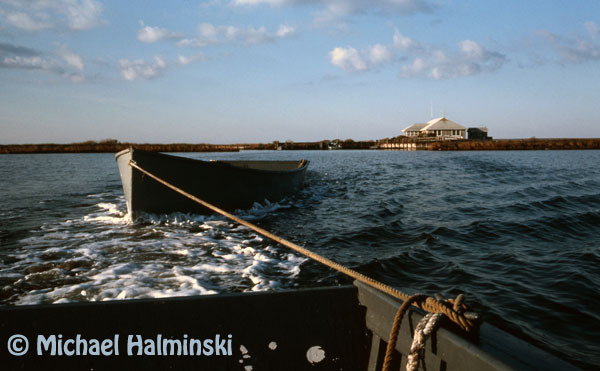 I was a licensed guide at Gull Island for 5 years. The lodge at Gull Island had four bunk rooms, a mud room for gear and guns, a kitchen and dining area, a rec room with television, and a separate privy with generator room on the north side. It was a particularly comfortable building, especially considering its location, miles out in the Pamlico Sound. 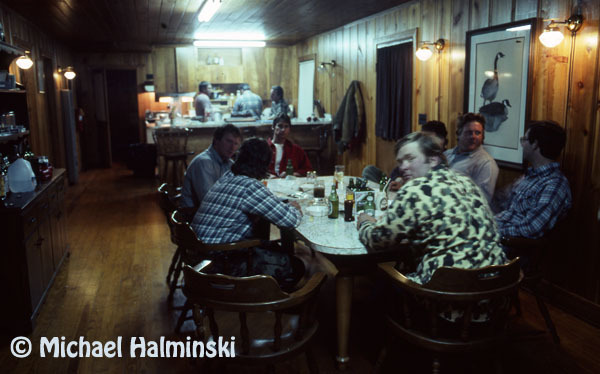 The interior was equipped with heaters, wall lamps and a refrigerator all run on propane. In the above photo, I am at the head of the table in red shirt. We were treated to some first-class hearty meals out there. Raymond Midgett was one of the hunting guides that I worked with. Here he runs the 24 foot skiff, that used a reliable 4 cylinder air-cooled Wisconsin engine for power. It was slow, but got the job done. Thus it was named Anytime. It was built in Avon by Willy Austin. 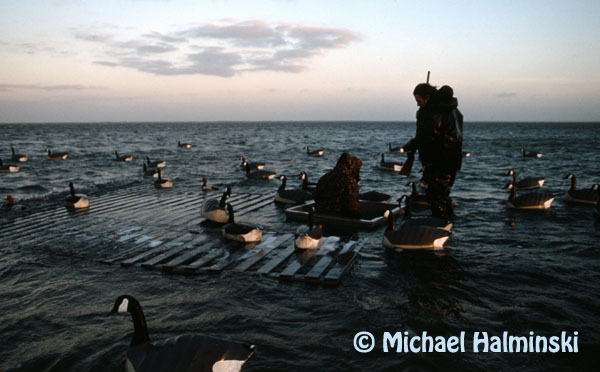 Here Anytime tows one of the decoy skiffs to pick up a hunting rig. Mark McCracken and Burt Hooper pick up after a day of hunting. Burt amazed me with his sharp vision. He could spot a flock of ducks a mile away and tell you what type of fowl they were, before you could even see them. Raymond Midgett throws out a stake blind rig, while I drag the skiff through the thigh deep water. This image was made of the same stake blind, taken from the north deck of the club house. I used a Nikon F2 with a Century 650mm lens attached. It shows shot hitting the water while the hunters fired at the “cripples”. 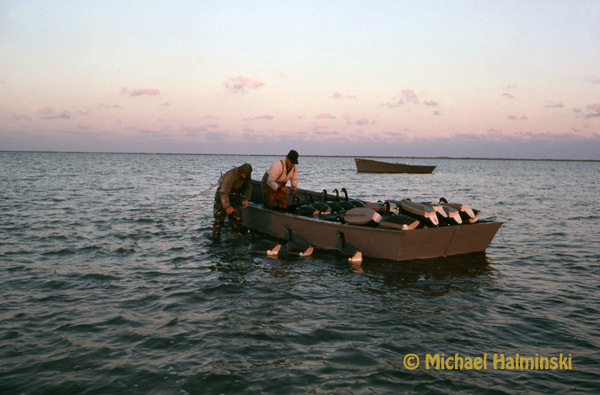 Michael Peele is a native of Hatteras, and was a regular hunter at Gull Island. 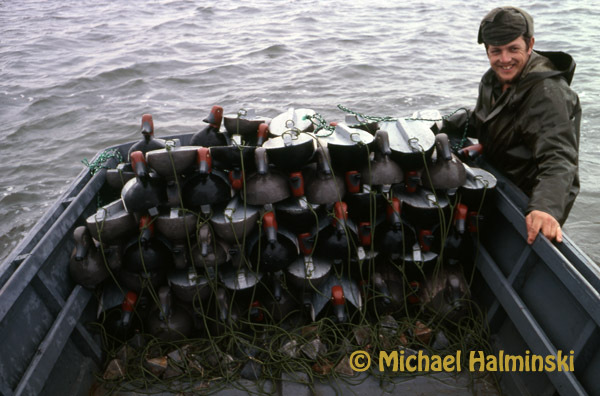 Here he poses with a skiff full of redhead decoys that I painted and rigged with lines and lead weights. Gull Island is where I learned to tie a bowline knot. Manson Meekins of Avon was also a regular visitor to Gull Island. The sink box, also called a battery box, required a lot of work to install, maintain and rig. We hunted three different sink boxes around the island. They lured waterfowl and worked extremely well. 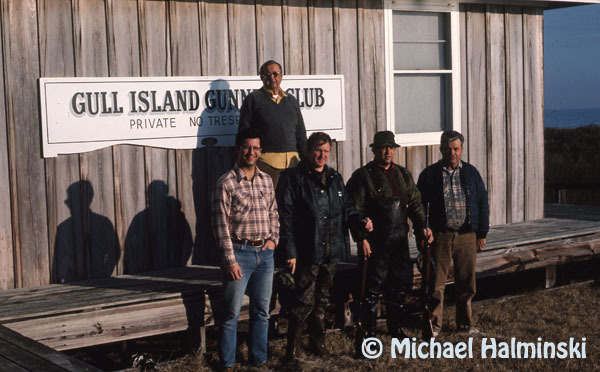 Alex Kotarides (standing on deck) was the owner of Gull Island Gunning Club. He also owned a huge bakery in Norfolk. Here he stands with nephew Chris (far left) and bakery employee Fred Keitch (far right). Alex was a very generous man. Every Christmas he would bring some local villagers turkeys and hams for the holidays. He also loaned me $1100 so that I could buy my first high quality telephoto lens. 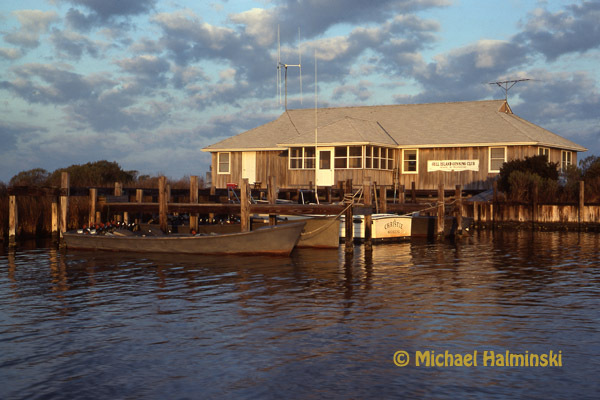 This is a shot of Gull Island Gunning Club taken during it’s glory days. I used the 400mm Novoflex lens (mentioned above) mounted to my F2 while standing in the marsh of Bay Landing on Hatteras. Gull Island is two miles away. Around 1990 while being renovated, the house accidentally burned to the ground. Today all that remains is the island, an old dock and a lot of memories. This entry was posted in Birds, buildings, hunting, Outer Banks, Pamlico Sound on February 1, 2010 by j0jgvm89bj.